The Uzbekistan Boxing Federation hosted its next national event the Women’s Elite and Youth National Championships in the city of Dzhizak. Rio 2016 Olympian Yodgoroy Mirzaeva won her weight class and several young talents shined in the National Championships such as Gulasal Sultanaliyeva, Sitora Shagdarova, Shakhnoza Yunusova and Mavluda Mavlonova. Dzhizak hosted the competition which is one of the capital cities of women’s boxing in Uzbekistan. The boxers who were born in 2001 and in 2002 were eligible to compete in the youth level and the competition was one of their first selections to the 2019 ASBC Asian Confederation Women’s Youth Boxing Championships. The first gold medal of the whole national event was delivered by Bukhara’s Junior National Champion Marzhona Savriyeva at the women’s youth light flyweight (48kg) who defeated Gozzal Kadyrova in the final. 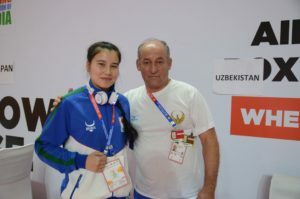 Ferghana’s Saidiniso Mukhammadaliyeva was also Junior National Champion in 2018 and she started her youth career with a gold medal at the flyweight (51kg) in Dzhizak where she was too strong for Andizhan’s Shakhriniso Khusanboyeva. Sitora Turdibekova was Junior National Champion in 2018 but she had to meet with ASBC Asian Confederation Women’s Youth Boxing Championships quarter-finalist Nasiba Khairullayeva in the final of the youth featherweight (57kg). In spite of Turdibekova’s less chances she won their top level final by split decision in Dzhizak. Bukhara’s Ziyoda Yarashova achieved bronze in the 2018 edition which she changed into gold at the youth lightweight (60kg) in Dzhizak. Khadijabonu Abdullayeva won international tournaments in Kazakhstan and she proved her powerful skills at the youth welterweight (69kg) in Dzhizak. Samarkand’s Navbakhor Khamidova was titleholder in the youth middleweight (75kg) therefore she dominated all of her fights including her final against Sokhiba Ruzmetova in Dzhizak. Navoy’s Dildora Saidullayeva moved down to the light heavyweight (81kg) but she captured her second Youth National title in the event. The first gold medal in the elite level was taken by Namangan’s AIBA Women’s World Boxing Championships competitor Gulasal Sultanaliyeva who defeated Fotimakhon Tursunboyeva in the final of the light flyweight (48kg). Sitora Shagdarova was bronze medallist at the 2018 Youth National Championships but in her first ever elite competition the 18-year-old talent won the gold medal following her success over Olmos Tukhtasinova. Dzhizak’s Azizabonu Mamirova attended already in the Albena 2013 AIBA Women’s Junior World Boxing Championships and following her hard work she defeated Bukhara’s Farangiz Khoshimova in the final of the bantamweight (54kg). Ferghana’s Khursandoy Kholmatova won the next category the featherweight (57kg) where she walked over to the title following her top rival Aziza Yokubova was unable to box against her in the final. Tashkent’s Yodgoroy Mirzaeva was Uzbekistan’s first Olympian female boxer and following two bronze medals at the ASBC Asian Confederation Women’s Boxing Championships she returned to the lightweight (60kg). The 23-year-old boxer spent less than three minutes in the ring when she stopped Gulim Urazimbetova in the final. Dzhizak’s second elite title was achieved by 21-year-old Maftunakhon Melieva who was slightly better than Bukhara’s Youth National Champion teenage talent Makhliyo Rakhimova. Namangan’s Shakhnoza Yunusova joined to the elite level only in 2018 but she won contest also in the New Delhi AIBA Women’s World Boxing Championships last November. The 19-year-old boxer was too smart for Ferghana’s Khayotjon Zharmatova in the final. Kashkadarya’s Mavluda Mavlonova was born in 1999 as Shakhnoza Yunusova but she had more than enough experiences to stop Navoy’s Dildora Jurayeva in the final of the middleweight (75kg). 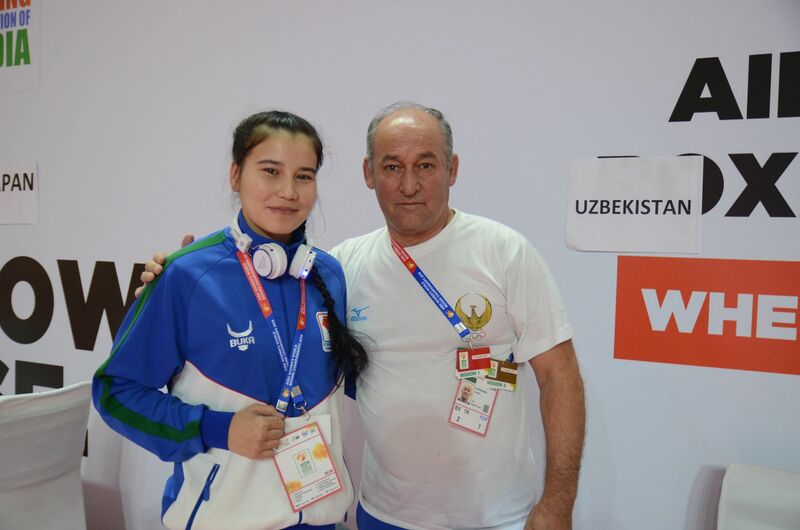 The last two titles of the Uzbekistan Women’s National Championships were achieved by Dzhizak’s strong favourite Ezozakhon Melieva (81kg) and Ferghana’s Mokhira Abdullayeva (+81kg).